Before leaving Murphy’s Cove we were treated to a stunning sunrise – But as they say red sky in the morning – shepherds warning – and this certainly proved true. We’ve started to get some driving under our belts and have moved around 1000 miles across Canada from the East Coast to Montreal in the last few days. 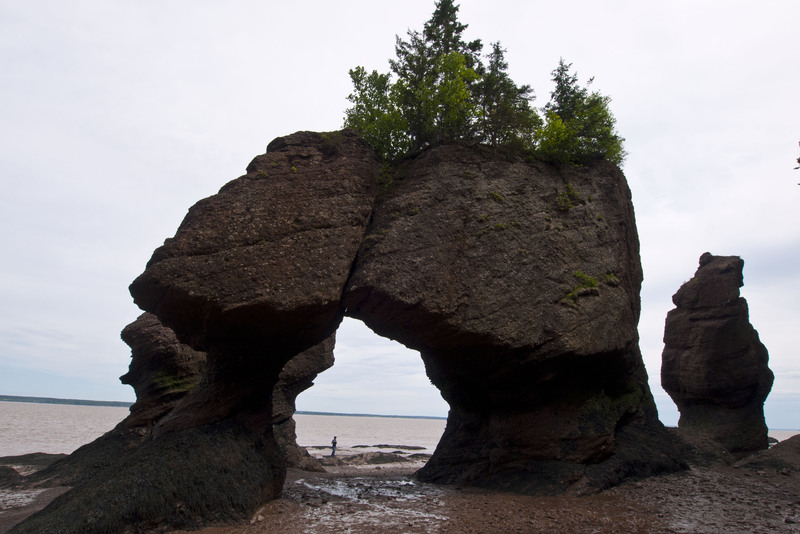 Our first stop on the way was Fundy National Park. The weather was so horrible though that we just stayed the nights and moved on. According to all the Canadians that we have spoken to this has been the worst spring/start to summer that they can remember and it has been constantly raining for weeks. We discovered on the way to Fundy that our Sat Nav does not function like you would expect in the UK. Minor roads here can mean terrible roads or even unpaved roads and we ended up doing almost 100 km on them this morning. No problem for the Beast but you just have to go slow or be really bounced around. 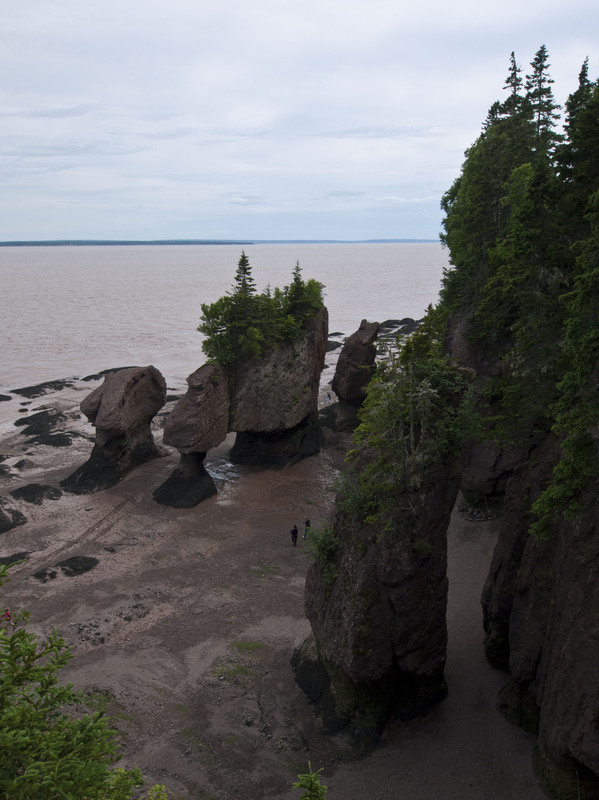 We did stop off on the way to Fundy at Hopewell Rocks, according to a visitor information centre “The premier attraction in New Brunswick”. We duly paid CAN$9 each to go into the park. The rocks consist of a number of stacks on a beach which are fully exposed at low tide and become small islands at high tide. The tidal range in Fundy Bay is the biggest in the world. The park isn’t really that great and we felt a bit ripped off for our $9 each. After Fund NP we put in our first big days driving where we managed 467 miles. Bear in mind that the Beast is really only comfortable at 50 miles an hour. 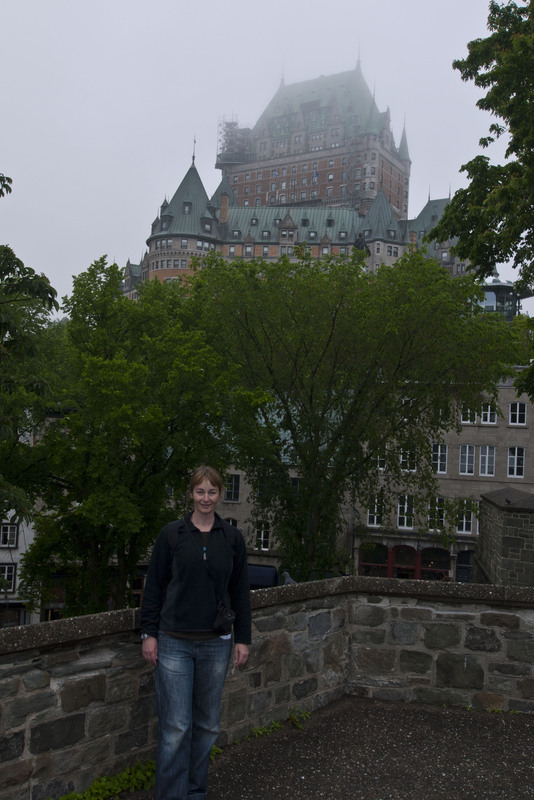 We arrived at Quebec City in the early evening and found a Walmart to spend the night. Walmarts are happy with RV’s staying overnight in their parking lots and the real advantage to this is – It’s free ! An observation that I made is that all through New Brunswick the signs were in two languages: French and English – very fair. As soon as you cross into Quebec not only do the roads deteriorate but the signs swap to only French. Seems typical of the French to me. 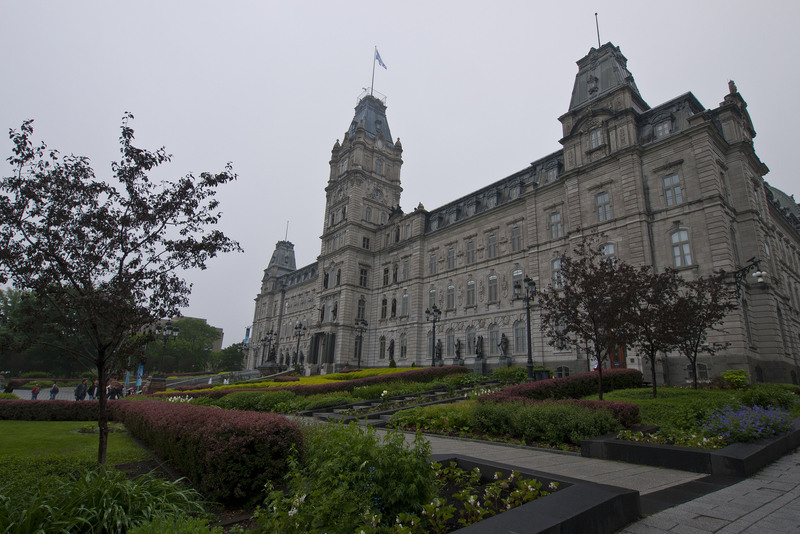 After spending the night in Walmart we headed into the centre of Quebec City and found a parking lot right on the docks next to the old town. We then spent a few hours walking round and exploring what is a very pretty small city. The old town is very small and only takes a short while to walk round. 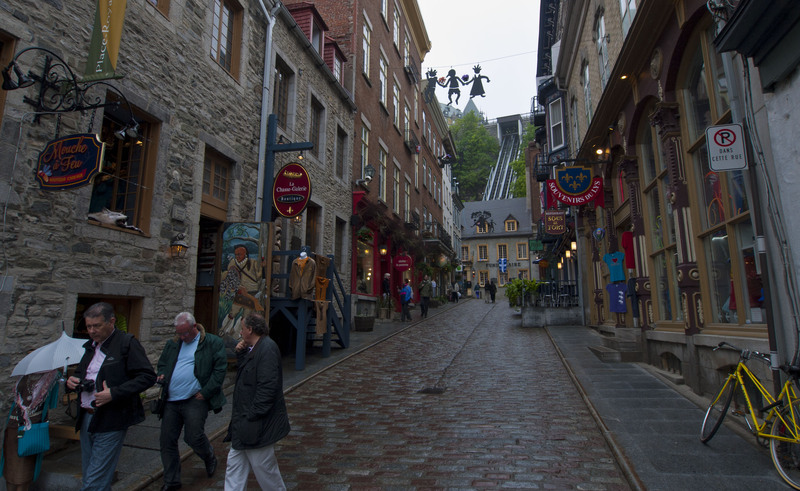 It feels like you are in France and doesn’t feel like anywhere else I’ve been in North America. 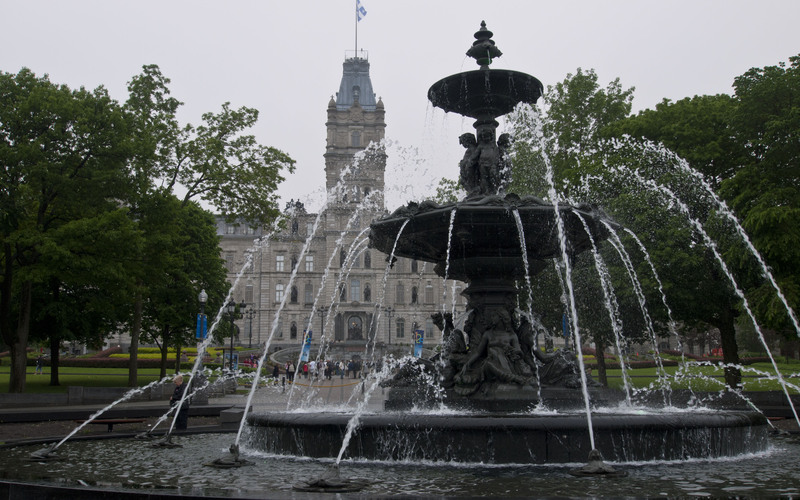 After lunch in a French bistro – like something off the Champs Elysee, but cheaper, we got back on the road and drove through torrential rain to Montreal. We’re now in another Walmart car park spending the night before going into the centre tomorrow to explore. Hi Mark, Sounds like you are motoring along and certainly getting your trip really underway, shame about the weather though, sounds like er… London in November!! note, we are currently in a grip of a heatwave, 92 F today apparently. Sounds as if you are learning a bit everyday about the Beast and it’s capabilities… Bad that it leaks though really, you should make a complaint, I would! I noticed your cheeky comment about the French…. So travel hasn’t broadened your views of the French yet??? So, now you have been travelling a while, sleeping in Wallmart car parks and enjoying some fine weather, how does it actually feel…so far what you anticipated, better, worse or as you thought? The weather has improved which is great – sunshine for last few days. The leak is fixed and I think the teething troubles are passed – hopefully. The distances that we have to travel feel vast so all feels a bit daunting. But we have settled into something of a routine and are making progress. You can’t expect me to like the french all of a sudden – the canadians are great. So friendly. Hope work is ok. Am missing work a bit – but not that much. 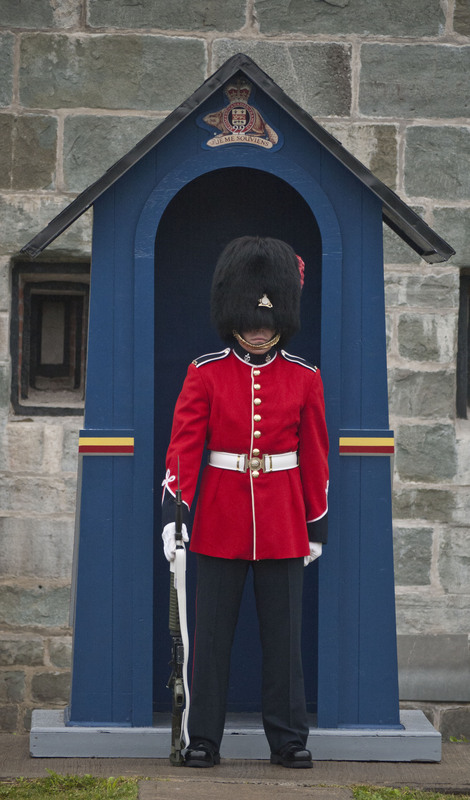 What the hell is that frog soldier doing in a british uniform! !